visit this page - new material is added from time to time. Bring your camera - we have no objection to photographs being taken (other than during services, of course). For many people the church in any town is an important place even if they never actually use it for its intended purpose, for it speaks of community and continuity. I f you question that, see the public reaction to many places if someone has the temerity to suggest that 'their' church should be made redundant. Why should this be? Often it has to do with the age, for the church is frequently the oldest building in the neighbourhood. It was the major meeting place for all sorts of different purposes, a place of sanctuary and early warning of invasions, a market place and community hall as well as a place of worship. So often the church was the only imposing stone edifice in a locality when even the Lord of the Manor lived in a wattle and daub construction. So even if the present building on the site does not owe a great deal to the original, because all churches have evolved throughout their history, it still remains a "special place." Historically it is a special place, but it will also have personal associations as generations have marked the significant events in their family lives here. There is seldom a time in any week, winter or summer, when someone is not seen wandering around. This church very much belongs to Maldon - her citizens in home-spun leather doublet, crinolines and tweeds, top hats and feather boas, double breasted suits and donkey jackets have knelt before its altars, slept through sermons, moaned at the choice of hymns and hymn tunes as well as beautified its fabric. Happiness, thanksgiving, sadness and tragedy have been shared here and you may wish to think about that as you wander around and consider some of the events behind the memorials. You will see here some fine art and architecture, but above all we welcome you to a place of worship and the gathering place of God's people. It is a place of witness to the Christian Faith and all that it stands for. You will find this presented in many different ways as many generations have added to, taken away from, repositioned or redeployed parts of its structure as the needs or tastes of the day demanded. It was their place in their time and the church has always been more about people than buildings; it is a place of refurbishment, where spiritual batteries may be recharged. It is a place of peace in the midst of many conflicts. It is the home of the people of God - as well as God' house. So welcome to this place, let it speak to you and the particular needs you have at this time. Come again - for it may be that your needs then will be different from what they are now. In 1215 the Lateran Council decreed that Monastic Foundations which had "appropriated" benefices, should provide resident, perpetual Vicars and assign adequate provision for their maintenance. It was soon evident that the endowments of the two parishes (All Saints and St. Peter's) were insufficient to make this provision and in 1244 the parishes were united and have remained so ever since despite all the dramatic changes in ecclesiastical structure that the following centuries were to bring. And we think that the uniting of parishes under one Vicar is a modern thing! Under the terms of the union, All Saints was decreed to be the "mother church". Until the 17th century services were held in both churches, when the nave and chancel of St. Peter's fell down and All Saints then provided for the needs of both parishes. St. Peter's Tower survived and remained the responsibility of All Saints Church Council until quite recently; what seems to be the church attached to it is in fact a building commissioned by Archdeacon Plume of Rochester in 1704 to provide accommodation for his library, which he had bequeathed to the town of his birth, on the upper floor and Maldon Grammar School below. The collection of books is one of the finest of its period and the Vicar of All Saints along with the Rector St. Mary's and the Head Teacher of the Grammar School (now the Plume School) continue to serve on the Library's Board of Trustees. The Registers of both Parishes, St. Peter's dating from 1556 and All Saints from 1558 are in the custody of the Essex Record Office in Chelmsford. The Parishes were part of the Diocese of London until 1846, then Rochester until 1877, then St. Albans until 1914 and currently in the Diocese of Chelmsford. Having been in the gift of the Bishop of London, the Abbot of Beeleigh and a host of private individuals, the living has been in the gift of the Diocesan Bishop since 1903. The reredos was installed as part of the restoration of the church in 1869. There are five paintings oil on canvas surrounded by Victorian Gothic marble and stone columns typical of that period. The paintings are believed to be by Robert Nightingale (1815-1895) a well known local artist living in Maldon up until his death. He was orphaned at eight, raised by his aunts and was apprenticed to J Stannard a local painter and decorator where he learned to handle pigments, colours and brushes which were untilized in the business. He also took classes at the Royal Academy Schools and exhibited there from 1847-74. He was known for both portraits and horse paintings and amongst his private patrons was Viscount Chaplin. He painted Viscount's Derby winner in 1867 Hermit. However, he also won plenty of commissions from Essex farmers for paintings of their cattle and hounds as well as hunters. A well-established artist in his day, he painted at least two Derby winners, but today he is less recognized, partly because his works seldom appear on the market or in public collections although two are in the Ipswich Museum. He was the father of the sporting painter Basil Nightingale and it is known that they worked together on certain paintings. The reredos consists of five paintings four of which measure 15"x36" and the middle panel of the Crucifixion 30"x48" oil on canvas with guilded background on gesso. All held in place by gilded wooden batons inset in the stone gothic carved frame. Special mention must be made of the Washington Window which is located in the D'Arcy Chapel. Full descriptive leaflets are available at the church. The Washington Window was given to All Saints' Church by the citizens of Malden, Massachusetts, U.S.A. in memory of the life of the Revd. Laurence Washington, formerly Rector of Purleigh, Essex, and grea t-great-grandfather of George Washington, the first President of the United States of America. Laurence Washington was a loyalist clergyman, ejected from his living and buried somewhere in our churchyard in 1652 (a time when graves were not marked so we do not know where his is situated). A record of his entry in the burial register may be found on the adjacent wall. A book listing the donors is on the window ledge. 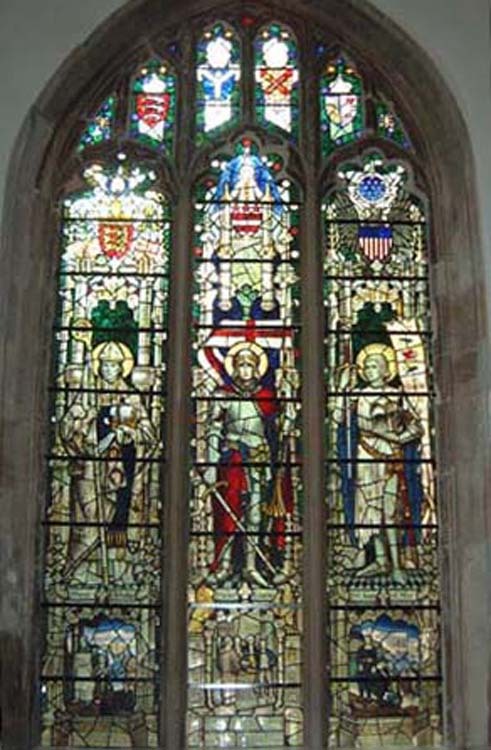 The window was dedicated in All Saints on 5th July 1928 in the presence of the Bishop of Chelmsford, the Bishop of New Jersey, the Lord Lieutenant of Essex and the American Ambassador. After 77 years the ravages of time had taken their toll on the window and it was completely refurbished in 2005 and re-dedicated on 31st July of that year, looking much as it did when originally installed. It is interesting to note that, at that re-dedication, there was present two members of our congregation who attended the original dedication all those years previously. The commemorative programme of dedication and the story of how the window came to Maldon has recently been reproduced in a way which reflects, as accurately as possible, the original programme. Copies of this are available, post free, at a cost of £2. More than eighty years have passed since the unveiling of the Washington Window which still attracts many visitors from far and wide to our church. After 77 years, the ravages of time had taken their toll on the window and it was completely refurbished in 2005 and rededicated on 31st July of that year, looking much as it did when originally installed. Present at that service were three people who had attended the1928 dedication. There are few remaining copies of the original souvenir programme of the first unveiling so it is likely that many people have never had the opportunity to read about this memorable occasion. Every attempt has been made to accurately reproduce this document with the use of modern technology; hopefully it will prove to be of interest and fulfil its aim to make everybody who reads it a little more aware of the fascinating history of our beautiful All Saints’ Maldon Church. By W.GURNEY BENHAM, F.S.A., F.R.Hist.S. The name Maldon is evidently of Saxon origin. The Saxons spelt it Máel-dun, and this probably meant “the meeting-place hill” - the hill of assembly. Morant says that “mael” meant cross, but there seems to be no authority for this. In earlier times under some forgotten name or names, the place was occupied. Palæolithic and Neolithic men left their weapons and implements here as evidence of their occupation. Later came the Romans, and they, as usual, left behind them Roman money and Roman pots and lamps and stone coffins and trinkets. The Anglo-Saxon Chronicle states that Edward the Elder established a “burh” (borough) at Maldon about 921, but this must not be considered the beginning of Maldon. It is related in another record that Edward the Elder had stayed at “Mealdune” in 913, and the town or “burh” had existed probably long before that date. From 913 to 993 Maldon was constantly harried by the Danes. Somewhere about the year 993 was fought the almost incredible Battle of Maldon, between the Danes and Saxons. A remarkable Saxon poem tells of terrific slaughter and prodigious bravery on both sides. The Saxon Earl Brihtnoth, who had defied the Danes, was amongst the slain. The old Chronicle of Ely says that the battle lasted fourteen days. “The Danes kept the field,” says the Anglo-Saxon Chronicle, which is a roundabout way of confessing that the Saxons were rather badly defeated and that the Danes took possession of Maldon. At this time and for many centuries later, Maldon and Colchester were the chief towns of Essex. Both were Royal Towns owned by the Sovereign, - doing special service to the King because of this ownership, and possessing special privileges. Domesday Book tells of the mint—the right of having moneyers authorised to make and issue the coin of the realm—for which privilege Maldon and Colchester were supposed to pay the King £20 a year. Both towns were invariably in arrear and they combined from time to time, with more or less success, to secure remissions of the payment. It is significant that in Domesday Book the “burgesses” of Maldon are mentioned. Both Maldon and Colchester were recognised as “boroughs” before they had Royal Charters of incorporation. The fine Borough Mace dates from 1687 and was made for the first Mayor of the Borough. Until 1686-7 the chief Officers of the Borough were two Bailiffs elected annually. The Charter of 1686 changed this and made the Chief Magistrate Mayor. The only difference is that the final “e” of “Maldone” is omitted on the reverse, perhaps because the space is covered by the flag of the ship. This ship, it may be supposed, denoted the “service” of a war-ship for the King, already referred to. The shield on the obverse bears the three lions passant gardant—the Royal Arms of England. On the later Borough Seal of 1682 (now in use) these lions are shown with their heads turned backward—“regardant”—as the as the heralds say. There has long been a question as to whether the Borough Arms of Maldon, which are founded on the Borough Seal, should show the three lions looking back or facing the spectator. The correct arms (as recorded at the College of Arms in 1614 and 1644) are in accordance with the ancient seal of the 14th century and as shown on the cover of this book. The distinguished honour of displaying the Royal Lions as shown in the original seal should not be forfeited. It indicates that Maldon from time immemorial was a Royal Town. There were three Ancient Churches in Maldon– St. Peter’s (of which the Tower only survives, St. Mary’s (the tower of which shows Norman work with Roman materials), and All Saints’ (combined with St. Peter’s), dating probably from Saxon times (1056), though the present building is of later date. All Saints’ Church will have special mention, in connection with the Laurence Washington burial entry. Other buildings of interest in Maldon include the Town Hall, formerly “D’Arcy’s Tower” was built in the reign of Henry VI (1422-1461); the Grammar School (founded in 1608 and reconstructed 1684); the 18th Century Plume Library, housed on the site of the former nave of St. Peter’s Church; ruins of St. Giles’s Hospital, founded about 1164, partly Norman, with 13th century and other later work; and most important of all, Beeleigh Abbey, which is separately described. This Laurence Washington was the great-great-grandfather of the immortal George Washington, first President of the United States. Laur. Washington was ejected by sequestration for his Loyalty in the late Rebellion of 1642. The actual year of his ejectment seems to have been 1643. The living of Purleigh belonged to the Horsmanden family from about 1625 onwards. It was a valuable living. The village is very large in area, more than 50 per cent larger in acreage than the Borough of Maldon. Laurence Washington had held no other living in the London diocese. It is evident that he was ejected from Purleigh solely because he was a supporter of Charles the First and (probably) an upholder of the liturgy and those observances which were unfavourably regarded by the Presbyterians and Independents. A Gentleman, a Justice of the Peace in this County (Essex), who personally knew him, assures me that he took him to be a very Worthy, Pious man; that as often as he was in his Company he always appeared to be a very Modest, Sober person; and that he was recommended as such by several Gentlemen. Mr Washington was afterwards permitted to have and continue upon a Living in these parts, but it was such a Poor and Miserable one that it was always with Difficulty that anyone was persuaded to Accept it. This may refer to a curacy at Maldon or its neighbourhood. There is no evidence that Laurence Washington held any other “living” in Essex or elsewhere, after his expulsion from Purleigh. As, however, he died at Maldon ten years after the expulsion it is probable that he had some kind of ministerial duty there or in the neighbourhood. There accompanies this Souvenir a coloured photograph of the magnificent stained glass window unveiled at All Saints’ Church, Maldon, on the 5th July, 1928 by the Official Representative of the Ambassador of the United States of America, and dedicated by the Bishop of Chelmsford to the memory of Laurence Washington. This Window, which will be seen in the Chancel of the D’Arcy Chapel on the South side of the Church, was the joint gift of the Citizens of Malden, Massachusetts, and the Sulgrave Institution, U.S.A., and is rightly regarded as a presentation of International interest. The suggestion of the gift emanated from the Vicar of All Saints, the Revd. I.L. Seymour, who, by invitation in 1924, attended the 275th Anniversary of the founding of Malden, U.S.A. The American donors expressed a desire that their gift should be an outstanding expression of friendly relations among English-speaking peoples. “Patriotism” is represented in the centre light by the figure of St. George, the Patron Saint of the Anglo-Saxon Race; “Freedom,” in the right-hand light by St. Joan of Arc, and “Colonization” in the left-hand light by St. Nicholas, the Patron Saint of Sailors and also of those who settle in far lands. St. Nicholas appears in full episcopal vestments and holds in his left hand a model of the “Mayflower.” St. George is in Gothic armour holding his red cross banner in one hand and his drawn sword in the other, and St. Joan of Arc holds aloft in her right hand the sword of Fierbois and in her left the embroidered banner on which is depicted Our Lord in Majesty with two attendant Angels and the word “Jesu Maria.” Other lights in the Window represent the Landing of Columbus, the Lion of England, the Eagle of America, the Liberty Bell at Philadelphia, the Washington Monument at Washington, George Washington signing the Declaration of Independence, the Arms of America, the Landing of the Pilgrim Fathers and the Statue of Liberty outside New York Harbour. The tracery lights show the Coat of Arms of the County of Essex, of the Borough of Maldon, the Province of Canterbury and the Diocese of Chelmsford. A handsome book bound in vellum containing the names of the donors has also been placed in a case under the Window inside. Whilst upon the subject of George Washington and his connection with Laurence Washington of Purleigh and of Maldon, it may be of interest to recall the fact that the ancient First Battalion of the Essex Regiment, formerly the 44th (East Essex) Regiment of Foot, prides itself on a very notable and close association with George Washington. Colonel Washington (the famous George Washington) was volunteer Aide-de-Camp to General Braddock, the incredibly brave but incompetent commander of the expedition against Fort du Quesne. Washington was seized with fever and forced to remain behind, relinquishing the covered waggon in which he had been hitherto conveyed. Nevertheless the young officer rejoined the advanced division on the 8th of July , and, although much debilitated, mounted his horse on the following day, when he ably conducted the retreat from the disastrous engagement. This had lasted two hours and twenty minutes, during which time the men had fired all the cartridges they could find—their own and those from dead and wounded. General Braddock had had five horses shot under him and a musket ball through his right arm and lungs and the British had lost seven hundred men. Washington, who had two horses shot under him, often spoke in after years of the display of the British troops on the eventful morning of the 9th, as being the most beautiful spectacle he had ever beheld. This was the first engagement of the Forty-Fourth, who were one of the two regiments under General Braddock’s command. Their Colonel fell in the action. It is a coincidence that the 1st Battalion Essex Regiment was engaged twenty-one years later (in 1776) in the reduction of Fort Washington, and that still later in 1814, by the fortune of war, they participated in the advance on Washington and the attack on General Winder’s troops near the village of Bladensburg. But they are more proud of having had the great George Washington as a brave and distinguished comrade-in-arms in 1755. It is of special interest then that on the occasion at Maldon, when honour was done to George Washington and his ancestor, the Silver Drums of the old 44th, now the 1st Batt. The Essex Regiment, should have added their tribute. A detailed account of this interesting Church is given below. When Robert Mantell endowed and re-founded Beeleigh Abbey in 1180 he gave as part of the Abbey’s endowment the Churches of All Saints and St. Peter, Maldon—that is to say, their advowsons, tithes and other possessions. The Church of All Saints was perhaps in existence before the Norman Conquest. The present structure dates from about 1250, but there is evidence of an earlier Church in the presence of re-used Norman fabric of the previous century. It has been thought th at Robert Mantell who presented All Saints Church to Beeleigh Abbey in 1180 may have also founded and built the Church. Although this guess may be correct it is equally likely that it is wrong. Robert Mantell gave to Beeleigh Abbey not only All Saints’ Church, but St. Peter’s, Maldon, St. Lawrence (Newland) and half the Church of St. Margaret, Bures (i.e. Bowers Gifford). Robert Mantell need not be credited with having founded all these Churches. Indeed, it may be confidently supposed that Maldon, an important place in pre-Conquest days, had a Church or Churches for its Saxon inhabitants. The Tower or Steeple of All Saints, with a Spire on it, is built in the form of an equilateral Triangle, which I could not forbear taking Notice of, because I never saw or heard of a Church Steeple built in that Form. The Tower was built about 1250 but it contains re-used Norman material of the previous century, indicating the presence of an earlier Norman or Saxon church. The South Arcade with the south aisle were built about 1330 and the crypt under the aisle (an old “bonehouse”) is of the same date. About 1443 the South Chapel of All Saints was built, probably as the Chantry of Sir Robert D’Arcy which was founded in 1443. The North Chapel was added somewhat later. The Nave was entirely rebuilt in 1728 with the Chancel. The Church was restored in the 19th century and also in the 20th century, and the North Porch is modern. In the South Aisle is some remarkable good carved work of about 1330 or a little later. The arcading is specially fine and interesting. Many old brasses were once in this Church, but they have gone—only the indents being left. Of the old monuments which survive the most interesting is the fine monument of Thomas Cammocke and his two wives (in the North Chapel). It has been placed too high to allow a proper inspection. It is a marble monument with a figure of Thomas Cammocke in the central compartment and his two wives Ursula (Wyrley) and Frances (Rich) kneeling on his left and right. Thomas Cammocke, of Maldon, died March 29, 1602. He had 22 children (nine by his first wife and thirteen by his second). They are shown beneath their respective mothers. This Sir Robert Rich, second Lord Rich, was eldest son of the famous and unscrupulous Sir Richard Rich, Lord Chancellor, and first Baron Rich, who built “delicious Leez” at Leighs, in Essex, and founded Felsted school near by, and who was one of the executors of the will of Henry VIII. His eldest son, father of Frances Rich, was born about 1537 and died in 1581. It was his (the Lord Chancellor’s) grandson Robert, third Lord Rich, who, in 1618, became the first Earl of Warwick (of the Rich family). This first Earl of Warwick married the notorious Penelope Devereux in March, 1581, and could not have been the father of Frances Cammock, who in 1602, was the mother of 13 children. She was actually his sister. Whether or not it spoils the story of the elopement, it must be remarked that the adventurous and romantic Captain Cammocke was at the time a widower with nine children. He was a wealthy man with large estates in Essex, but in spite of his 22 children, of whom six were sons, his family seems to have become extinct in Essex soon after his death. In fact they disappeared so quickly and completely that one is Tempted to speculate whether they could possibly have been amongst the Essex people who emigrated to America in the 17th century. Cammack in Indiana State is a town which was not founded until the end of the 18th century. How did it get its name? There are inscriptions in All Saints’ Church to four members of the Malden family of Maldon, all dating between 1745 and 1798. A mural monument in the South Chapel is in memory of Henry Wentworth, Counsellor at Law, and “Annastacy” (otherwise Anastasia) his wife. He died in 1614, and she in 1634. She was daughter of William Hale of Maldon. Her husband was great-grandson of Sir Roger Wentworth, scion of a noted and romantic family. 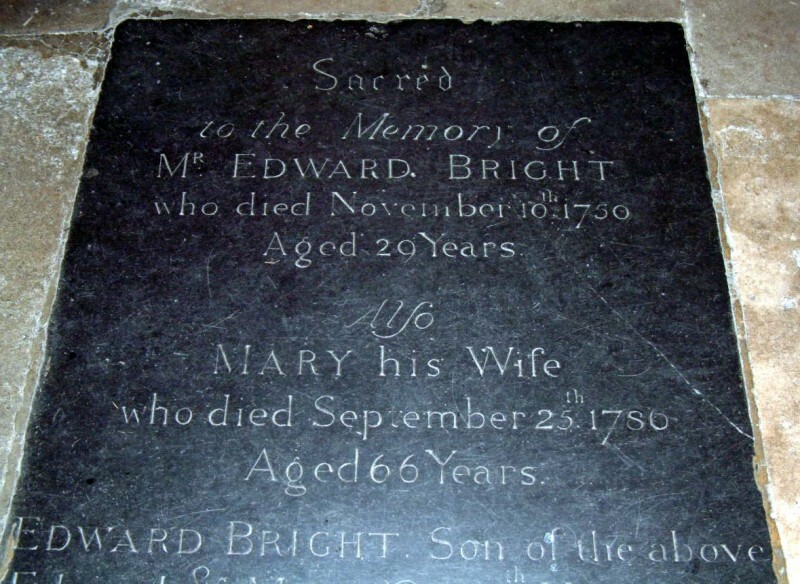 Amongst other inscriptions are several to members of the old Maldon family of Bright, including:- Edward Bright, who died Nov. 10, 1756 aged 29. He weighed 44 stones, measured 5½ feet around the chest, and 6ft. 11in. round the stomach. He was 5ft 9½ in. high. After his death a wager was decided at the Black Bull, Maldon, whether five men could be buttoned within his waistcoat. Actually seven men were buttoned inside “without breaking a stitch or straining a button.” His memorial is near the font. It is said that an “engine” was specially fixed in the church on the occasion of the funeral to lower his body into the grave. Daniel Lambert (d. 1809) is said to have been the most corpulent man of who there is authentic record. Edward Bright of Maldon ranks second only to him. In the South Chapel are fragments of old stained glass (Flemish). The East Window of the Chancel is in memory of the Rev. E.R. Horwood, vicar from 1850 to 1901. In the south wall of the Church is a fine window of beautiful design to the memory of the son of Mr. F.H. Bright, Town Clerk of Maldon, and Churchwarden. A window in the D’Arcy Chapel (South Chapel) is in memory of Henry Coape, erected in 1848 by his widow and children. In the Belfry is a beautiful window “given by the children of the parish in 1908.” It represents the Good Shepherd. Outside the belfry, under a canopy, hangs an old Sanctus Bell with a Latin inscription stating that it was made by John Swain and Richard Lynn. The lettering appears to be 15th or early 16th century, but no bellfounders are known of the names mentioned. What Pleasant Musick six shall be. Residence of R.E. THOMAS , Esq. The figures inserted with good effect in niches outside the church are modern and were placed there in 1907. Over the Porch is shown St. Cedd, Bishop of the East Saxons in 653. Next to him is Earl Brihtnoth, the Saxon Thane, killed in the Battle of Maldon (c. 993). Beyond are Robert Mantell, founder of Beeleigh Abbey (1180); Sir Robert D’Arcy, M.P. for Maldon temp. Henry VI. ; and Archdeacon Thomas Plume, D.D., who died in 1704, founder of the Plume Library in St. Peter’s Church. On the West wall is a figure of Mellitus, first Bishop of London, and afterward, third Archbishop of Canterbury, reputed to have been consecrated bishop by St. Augustine and described as “the first to bring the Gospel to heathen Essex.” He died A.D. 624. As already stated, only the Tower of this ancient Parish Church remains. St. Peter’s church was given to Beeleigh Abbey by Robert Mantell in 1180. In 1306, on account of the insufficient income of each the Bishop of London, with the consent of the Abbot of Beeleigh, united the two so-called “livings” and they have been conjoined ever since. Henry V (c. 1416) established a chantry or guild in St. Peter’s in order that a priest should sing mass there “to pray for the said King Henry”; also “to keep a school there.” The building on the site of the church was placed there by Archdeacon Thomas Plume, D.D., the lower part being formerly used as a Grammar School and the upper part of a library, which Dr. Plume “furnished with his own books.” The Plume Library contains many valuable manuscripts. There is documentary evidence for assuming that this church was founded in Saxon times. The present structure is largely modern, but the nave dates from about 1150, the chancel arch from about 1320 and the north porch from about 1420. Beeleigh Abbey at Maldon is one of the chief treasures and glories of Essex. It is impossible here to do justice to its many points of interest. Mr. R.E. Thomas, husband of the present owner, has issued a sumptuously illustrated book, in which the architectural and historical interest of the abbey is worthily set forth. It must suffice here to say that about 1180 certain monks at Parndon in Essex changed their abode and migrated to Maldon, where Robert Mantell, lord of the manor of Little Maldon, founded Beeleigh Abbey for them, granting a site for them in his manor, and endowing the Abbey which he erected with many possessions. These grants were confirmed by Richard I in a Charter, dated at Dover on Dec. 7, 1189. Robert Mantell and his sons were patrons of the Abbey till, on the death of the younger son, the family became extinct in the male line. Lucy Mantell, the grand-daughter of the founder, married a Fillol, and from the Fillol family it descended eventually to the De Bourchiers, who held it till its dissolution in 1536. The subsequent owners of the Abbey were numerous. It was purchased in 1920 by Mrs. R.E. Thomas. Mr. and Mrs. Thomas have taken pride and infinite pains in preserving the Abbey since its restoration in 1912 by Mr. B. Ionides, and have been most generous in allowing facilities to the public for visiting the buildings and their precincts. The Old Church of the abbey was destroyed soon after the Dissolution, and the precinct wall and gate house have disappeared. The sites of the old Cloister and of the Frater Range have been identified. The Chapter-house (early 13th century), with vaulted roof and ancient windows, is of great interest. Other portions of the Abbey preserved are the large Dormitory, its remarkable Undercroft, the Warming House, and various doors and details of architectural and historical interest. The Tudor buildings erected after the Dissolution of the Abbey are preserved in part, but have been altered in places and supplemented by 17th century additions. Beeleigh Abbey stands by the river and the house has picturesque surroundings. Gratitude is due to the enthusiasm and generous enterprise of the present owner and his predecessor, for the Abbey and its precincts were for a time in considerable danger of gradual decay and permanent degradation. The reader will almost certainly have noticed that there are a number of what would appear to be grammatical inaccuracies, unusual punctuations, spelling inconsistencies and inexplicable word capitalisations in this reproduction—none of which are attributable to me. I have resisted the temptation to correct these as my aim has been all the time to produce a faithful copy of the original document. Hopefully this has not spoilt your enjoyment of our publication in any way. Thank you for purchasing this little book. All proceeds from the sale are being donated towards church re-ordering expenses. Beeleigh Abbey near Maldon in Essex, England, was a monastery constructed in 1180 for the White Canons, otherwise known as the Norbertines or Premonstatensians. The order linked the change of the separate life of the monks in the 12 century with the retrospective life of the friar, who was considerably more active. Beeleigh Abbey was originally a daughter of Newsham Abbey in Lincolnshire, established at the instigation of Robert de Mantell, lord of the manor of Little Maldon. The abbey obtained a royal charter from Richard l in 1189. The heart of Saint Roger Niger of Beeleigh (a thirteenth-century Bishop of London) was buried at Beeleigh and the abbey became a pilgrimage site. In 1289, pilgrims included King Edward I and Queen Eleanor. After the dissolution of the monasteries, many of the abbey buildings were pulled down. In 1540, Henry VIII granted the abbey and lands to Sir John Gate, Chancellor of the Duchy of Lancaster. Thirty years after the land was given away there was an extension added to the abbey of a farmhouse. During the 18th century, the building was used as a public house. By the late 19th century, the buildings were in a ruinous condition, but in 1912, restoration was begun by Captain F. W. Grantham. In 1943, the Abbey was purchased by William Foyle, owner of Foyles bookshop. The abbey is now a private residence and is not generally open to the public, but small private groups may be shown around it by prior arrangement with the owners. The roofs of the resilient medieval buildings can be seen from a footpath that runs down market hill and ends following the River Chelmer. The abbey gardens, are now also open to the public, on specific days during the summer months. As a point of interesting recent history, the Premonstratensians returned to Essex in 2008, establishing a house at St. Philip's Priory in Chelmsford, some 8 miles from Beeleigh. In 2010 the Prior of St Philips Priory and three of the canons, were welcomed to Beeleigh Abbey, the first such visit by White Canons since the visit in 1955 by Father Norbert Backmund of Windberg Abbey in Bavaria. He was the first White Canon to have visited Beeleigh since the monastic dissolution in 1536. In April 2011, the Abbot General, worldwide head of the Premonstratensian Order (White Canons) in Rome, Father Thomas Handgraetinger, was welcomed at Beeleigh, together with the Prior of Chelmsford, Father Hugh Allan, and three canons. Father Hugh Allan, Prior of Chelmsford, was promoted to Abbot, and with the agreement of the owners of Beeleigh Abbey, Mr & Mrs Christopher Foyle, became Titular Abbot of Beeleigh, the first Abbot of Beeleigh since 1536. Father Hugh was enthroned Abbot by the Bishop of Brentwood in the presence of the Bishop Emeritus, the Anglican Bishop of Chelmsford, the High Sheriff of Essex and other Essex VIPs, many canons and clergy and a full congregation, on the 8th December 2016 at the Roman Catholic Church of Our Lady Immaculate in Chelmsford. Christopher Foyle presented the mitre to the Abbot. According to local myths the abbey is connected by an underground tunnel to All Saints' Church in Maldon, the reason for its construction supposedly being that during the dissolution of the monasteries the monks needed to be able to retreat to the church if the abbey was razed. One story relates that this tunnel apparently still existed some years ago and that its entrance was found by archaeologists. Finding it too full of debris to explore it themselves a dog was sent in, and some time later was heard barking in the depths of the abbey, and was found in its cellar. In August 2000, following the death in 1999 of the previous incumbent, William Foyle's daughter Christina Foyle, Christopher Foyle, chairman of Foyles Bookshops, and from 1978 until 2006, chairman of the Air Foyle Group, his cargo and passenger airline corporation, and his wife Catherine, purchased Beeleigh Abbey and its 400-acre estate beside the river Chelmer from Christina Foyle's executors. They then set about a four-year restoration of the Abbey and its gardens, which had deteriorated somewhat during the previous 30 years. As a result, in 2008, they were awarded, by the Royal Institution of Chartered Surveyors, their East of England Conservation Award, and later in the same year, their National Conservation Award, for the best restored historical building in the UK. In 2000, the owners arranged for an archaeological investigation of the site that continued until 2006. A geophysical survey was followed by an excavation. During the course of the investigation there were a number of "open days" which allowed hundreds of visitors to see the site. Nothing could be dated to the 1180 construction, but among the discoveries were the foundations of a medieval hall house, a brick clamp, and other outbuildings. Other finds included large amounts of pottery dated from the 12th to the 16th century, a small amount of early (13th - 16th century) coins, some jetons and a seal matrix that belonged to the Abbey. Further excavations were being planned for 2017. The vicarage must merit a mention as it is, after the three churches, the oldest building in Maldon. It was built as a vicarage in about 1350 and it has always been the vicarage of the parish except for a short period in the 18th Century when the then vicar thought it was not grand enough and moved himself into Friary House (at the bottom end of the public car park across the High Street) and housed his curate in the vicarage. The original house was raised to a second story in 1450 when Mr D'Arcy's bequest installed two chantry priests with a house and an acre of ground adjacent to the church. The substantial walled garden still exists within 50 metres of Maldon High Street. The most recent addition, the east wing, was added in 1670. For 200 years the half timbered fascia was covered with rendering until in 1902 it was stripped away and the porch restored to reveal the frontage in its full glory. From the rear it is much easier to see just how this house evolved. Inside there are some walled paintings dating from the 15th century and timbers reputed to have been trees at the time of the Norman Conquest. What is the difference between a Rector and a Vicar? St. Mary's in Maldon has a Rector and so does St. Andrew's in nearby Heybridge, so why does All Saints have a Vicar? As it is so often, the answer lies in history for in the present day there is no difference. The Rector is the person who received all the endowments, tithes and gifts of a parish - it was truly a "living". Some had more than one living, indeed some had many. In order to maintain the services in the parishes providing the revenue, a priest was installed to act on behalf of the Rector. The Latin word to describe such a person was a Vicarius - one who stands in place of - and that's just what the Vicar did. At All Saints the Rector was the Abbot of Beeleigh Abbey for nearly 300 years and the canons came as Vicarius. Details of Vicars of All Saints with St. Peter's as far as we know are shown below. Inevitably there are gaps, uncertainties and, perhaps, some inaccuracies but such as we have may be of passing interest. Prior to 1244 one name only has as yet been traced - that of Geoffrey, a Chaplain or Capellanus apparently of All Saints only, who seems to have been deputed by Beeleigh Abbey to conduct services in the church. The name Maldon is believed to come from the Saxon word Mealdun "dun" meaning the "cross on the hill" and the word "mael" meaning a "place of meeting". So it seems likely that although the oldest part of the present church (the tower) is 13th century, this probably replaced a place of worship from earlier times. But from speculation to reality! We know that in 1189, by a charter of Richard 1, both the churches of All Saints and St. Peter's were conveyed by Robert Mantell to the Abbot and Canons of Beeleigh Abbey, a monastic foundation he had established a few years earlier, a mile to the the west of Maldon. The two parishes were very different in nature. All Saints was small in area and cared for the centre of the town, providing for the merchants and guilds with chantry priests for the chantry chapels, while St. Peter's covered the edge of the town and large areas of the surrounding countryside. The Reverend Edward Russell Horwood, M.A. was, as far as we know, the longest serving incumbent of All Saints (1850 - 1901) and the Reverend Isaac Lothian Seymour, M.A (above) was another long server from 1917 to his death in 1947. Records show that both men were very much loved and respected by their parishioners. What can you see in it ? The cross is supreme over everything, reminding us of the sovereignty of Christ and that He is King of Kings and Lord of Lords. He has saved us all by his death on the cross and all people must look to him to be saved. We are reminded of our enormous task to share His good news with others and never to rest until those around us know and love Him. The circle reminds us of this world-wide task we have. It is the round world the Church must win for Christ. Every Christian must take their part in loving and serving others through their daily work and their free time. The world will accept only a Church that serves. We have no rights, only duties. The circle stands for a halo as well, reminding us that we are to be 'saints'. Not the plaster, fragile sort but ordinary folk dedicated to God's service in today's world. We are very conscious of our limitations and so we strive to be better Christians by worshipping more regularly, praying and studying our faith. This is all part of practical holiness which the halo suggests. Hidden away within the circle is a fish. The fish was a symbol of the early Church in days of persecution when the cross was a dangerous sign to show. The Greek initials of "Jesus Christ, God's Son, Saviour" make up the Greek word "fish". We use it to show that we are not alone in being 'saints' but part of God's great family - the Christian Church - here in Maldon and in the world. The (Koine = NT dialect) Greek word for fish - ΙΧΘΥΣ (ichthys), is an acronym for "Ἰησοῦς Χριστός, Θεοῦ Υἱός, Σωτήρ"
which translates into English as "Jesus Christ, Son of God, (my) Saviour"
Chi (ch) is the first letter of Christos (Χριστός), Greek for "anointed" (of the Lord). Theta (th) is the first letter of Theou (Θεοῦ), Greek for "God's", the genitive case of Θεóς, Theos", Greek for "God". Upsilon (y) is the first letter of (h)yios (Ὑἱός), Greek for "Son". Sigma (s) is the first letter of sōtēr (Σωτήρ), Greek for "Saviour"
A man with "a touch of swagger"
The other day I came face to face with a Tudor Maldonian. Over the years I had seen him from a distance (ever since my boyhood Sunday school days in fact) but I had never been quite that close before. Before you start worrying about me, I can tell you that the face belongs to an image on a monument in All Saints church. It's not just any old monument, but an impressive representation of an equally remarkable man - one Thomas Cammock. Recent work in the church has seen the insertion of a new mezzanine floor in the north (St. Katherine's) gild chapel. That new floor now allows us unprecedented access to Cammock's wall memorial above the priest's door and suddenly we can get up close to one of the most controversial characters in the long story of our town. Back in the late 1500s he was at the centre of a scandal and everyone in the neighbourhood was talking about him. To understand his story and the circumstances surrounding that event we must travel back to the 16th century. Born in 1540, the son of Robert Cammock of Layer Marney (d. 1585), Thomas was a minor country landowner of "gentle birth" but "barely cleared the rank of the yeomanry". He made his home in Maldon and he married well. His wife, Ursula Wyrley was the daughter of John Wyrley of Didford, in the county of Northamptonshire. The marriage was a succes sful one and she bore him no less than 4 sons and 5 daughters. Tragically, Ursula went to an early grave, leaving Thomas a grieving widower who found solace and diversion in his work. He was part of the retinue of Sir Robert, the second Lord Rich, who was the head of a powerful dynasty that acceded to the title of the Earls of Warwick. Thomas must have made a positive impression on his master and he became very close to the Lord and his family. However, it proved to be too cosy a relationship for he fell in love with Robert Rich's only daughter, Frances. Needless to say Lord Rich did not approve of the approaches of a widower and an employee, particularly one of little wealth and no title! But it didn't put the couple off and one stormy night whilst travelling between two of the Rich properties - Leez Priory (Little Leighs) and Rochford Hall, the couple made off and eloped. When the news reached Lord Rich he was less than pleased and instructed his son and his soldiers to go in pursuit. They eventually caught up with the couple at South Fambridge where the lovers were attempting to cross the Crouch and head on into Thomas's home town of Maldon. The trouble was that the ferry boat was moored on the other side of the river at North Fambridge. Thomas decided that there was nothing for it but to swim across to recover the craft. Frances, however, had other ideas and thanks to a remarkable surviving account (recorded by the antiquary, William Holman) we even know what she said. This determined young woman instructed Thomas to mount her horse with her so that they could combat the strong current together. She would, she said, "live or die with him". Lord Rich's soldiers reached the south bank as the couple were about half way across the river. At that moment the horse had second thoughts, turned round and swam back, depositing the couple in the hands of their pursuers! Nevertheless they somehow escaped, eventually crossed the river and rode on into Maldon where they "wedded and bedded" and went on to make their home throughout the 1580s and 90s. When Lord Rich heard the full story and how his daughter had "ventured her life" for Thomas, he changed his attitude and gave them his love and full support. Their union proved to be a most successful and happy one, leading to 2 more sons and 11 more daughters for Thomas! What must the locals have thought at the time? "Local widower runs off with Lord's daughter...Shocking incident at the Fambridge Ferry"! In some ways I suppose it gave them plenty of Tudor 'street-cred'! Thomas has subsequently been described in many different ways - an 'adventurer', a man with "a touch of swagger", even a 'pirate'. What we do know is that he wanted to do his bit for the local community, for in 1587 he paid for Maldon's very first convenient water supply - piped in a 600 yards lead conduit from his well in Beeleigh Road (the 'Crom' or 'St. Helen's Well') to a pump on St. Helen's Lane (now Cromwell Hill). He died a contented man at the end of March 1602. But he hasn't left us entirely and neither have his two kneeling wives, depicted in profile and staring at their shared husband and his 22 children of all ages and sizes in the 'predella' below - enough, one wit has said to play their own family game of cricket had it been invented by then! (They would have known a similar game called 'stoolball'). We can still meet them today and thanks to some church works in our own lifetime we can now become very intimate with them indeed. This information is provided by Stephen P. Nunn, a local historian, and is reproduced here with his kind permission. Edward Bright was born on 1 March 1721 in Great Waltham. Large as a child he was descended from families greatly inclined to corpulency. Later known as ‘the fat man at Maldon’ he was ‘supposed to be the biggest and weightiest man in the world’ and became a local and national celebrity. In 1733, aged 12 ½, and weighing 10 stones 4 pounds (65 kilos) he was apprenticed to Joseph Pattisson, a Maldon grocer. By the end of his seven-year apprenticeship his weight had increased to 24 stones (152 kilos). In the early 1740s he became a freeman of the borough of Maldon and married a young Enfield woman, Mary Browne. About the same time he became tenant of a High Street house and grocery shop; 57 & 59 High Street now occupy the site. He was also tenant of a candle workshop on Market Hill; part of Maldon Town Hall stands on the site. Bright died upstairs in his High Street house of a miliary fever on 10 November 1750, aged 29. At the time of his death he was 5’ 9 ½ ” (1.77 metres) tall, measured 5’ 6” (1.67 metres) around his chest, 6’ 11” (2.10 metres) around his belly and was estimated to weigh 44 stones (279 kilos). Two days after his death a way was cut through the wall and staircase to let his corpse down into the shop. His enormous coffin was taken to All Saints’ church and interred in a vault with the help of a triangle and pulleys. Edward, a Tallow chandler and Grocer of this Town was buried the 12th of November in the parish Church of All Saints near the Belfry Door. He weighed upwards of forty two Stone, Horseman's Weight, his Coffin was three feet Six inches over the shoulders, Six feet seven inches long and three feet deep. A way was cut through the wall and stair case to let it down into the shop; it was drawn upon a carriage to the church, slid upon Rollers to the vault made of brickwork & interred by the help of a Triangle and Pulleys. He was 29 years of age the first of March last; has left a widow now big with her Sixth child. He was a very honest Tradesman, a facetious companion, comely in his person, affable in his temper, a kind husband, a tender Father & valuable Friend. William Benson, Vicar. Shortly before his death, Edward Bright sent his waistcoat to a tailor for enlargement. The waistcoat became the subject of a wager between Mr Hance and Mr Codd at the Black Bull Inn next door but one to Edward’s house. The wager, depicted in a print ‘The Surpriseing Bett Decided’, was that five men aged 21 and resident in Maldon could be buttoned into Bright’s huge waistcoat. In the event ‘not only five, but seven men were, with the greatest ease included in the waistcoat, without the least straining or breaking of a stitch or button, to the great surprize of all the spectators’. The wager did not give entire satisfaction and another took place on 28 January 1751 at the King’s Head for ‘a ham and chickens, &c and gallons of wine’. This time the parties were Edward Codd and Mr Long against Mr Pattisson. Described in a print ‘The Surprizing Wager Decided’, nine men were ‘without any trouble, circumferenced within the aforesaid Mr. Bright’s waistcoat’. Whilst this discourse purports to deal with the life and times of Edward Russell Horwood, it in fact ventures into the Horwood family history generally. Quite surprisingly, for a man who had such an active and involved life, there is a lot we don’t know about him so to confine this discourse to the one man would, I fear, make for a very short talk. I shall, however, do my best to give you some insight into his life. For those who may not know, Edward was the vicar of All Saints’ Maldon for an incredible 51 years from 1850 to 1901 and Rural Dean from 1872 to 1898. He is, in the past 650 years, the longest serving incumbent of All Saints’ and, whilst not wishing to presume anything, I think it is unlikely that any of us will ever see a vicar serving us for longer at our church. His golden jubilee was on Friday 5thOctober 1900, just a few months before he died. We cannot claim that he is the longest serving vicar of this church as such records as exist show that Ralph de Luffenham was incumbent from 1294 to 1361 – 67 years – although there is, of course, no way of substantiating this. If anybody had mentioned Horwood’s name to me three or four years ago, I should probably have just looked blankly at them whilst desperately trying to think who he might be so it would not be appropriate for me to criticize anybody here today who may have looked at me equally blankly. Had I been more observant at that time, I might have noticed the plaque to the left of the choir vestry which mentions his name and this would have drawn me to the East Window which is dedicated to Edward. On my way back, if I looked on the left of the entrance to the D’Arcy chapel I would probably have seen the list of incumbents over the years with his name on it. So what led me along a path which has kept me busy for these many months? Round about 2006 an email popped up on my computer monitor and it was from a lady named Elizabeth Buchanan who lives in Orange on the east coast of Australia not far from Sydney. She had spotted my name on the church website and made contact to ask if I could provide any further information on the reverend gentleman who is the elder brother of Captain William Spry Horwood, great great grandfather of her husband, Brian. Further mention will be made of William later. I was able to provide her with a few snippets which she did not already have and, sensing my interest, she sent me volumes of information which she had already gleaned including a fascinating family tree which tells us much about the extensive Horwood family – a name which, sadly, seems to have all but disappeared. Since that time Elizabeth and I have become keyboard friends which is something akin to pen friends except that communication is carried out via computers. Fortunately I have a plan which allows me free international calls so we often speak by telephone too. Being a keen cricket fan, however, I have learnt that it is not the best idea to telephone Australians at a time when England are being soundly thrashed in a test match series! So, on to the point of my talk here today. Edward Russell Horwood was the second of ten children born to Edward senior and Harriett who lived in the Buckinghamshire village of Aston Clinton. Edward senior was a very wealthy man who started the business of Horwood and James, Land Agents, who at that time worked closely with the Duke of Buckingham. The company still exists but are now Horwood and James, Solicitors. Records show that the Horwoods occupied The Manor House, a magnificent mansion in Aston Clinton, for some ten years but it would appear that residency was only taken up in 1853, the year before Edward Senior died, so it is assumed that the family continued to reside there after his death. The property is referred to as far back as 1333 when it was owned by Sir William de Molyns and it was subsequently owned by many members of the nobility and even, in recent years, Noel Edmonds and then a yuppie city financier who wanted it as a holiday home. At the time Horwood occupied it, it was owned by Sir Anthony de Rothschild whose influence in the area is considerable. Some of Edward junior’s siblings will be mentioned today but I have also produced a family tree, based on information provided by my Australian friends, which may help give a better understanding of the family structure. Sizeable as this tree may appear, it only scratches the surface of the family. As I have already suggested, Edward’s family were wealthy and this wealth is illustrated by a codicil to Edward senior’s will in 1849. It made provision for an advowson in the name of Edward Russell. My understanding of an advowson is that it is in effect a sum of money paid or promised to purchase an incumbency – perhaps in a manner similar to the purchase of a commission in the army or navy at that time. This could be refused by the Bishop of the time but seldom was and the money paid was used to assist with the upkeep of the church. The advowson that Edward made was in the sum of £3,965 which may not seem excessive but remember that we are talking about 158 years ago. In today’s money this equates to about £375,000. 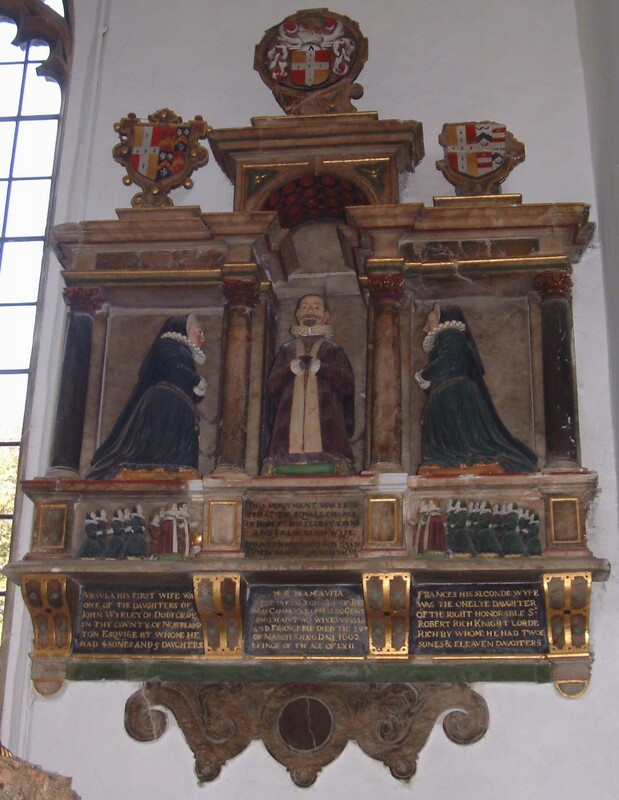 Appointed to the living at the age of 29, Edward was extremely popular with just about everybody in Maldon, worshippers and non-worshippers alike and it would be a gross understatement to say that he led a rather active life. He was a Justice of the Peace, school manager, member of the Maldon Board of Guardians, Governor of the grammar school, Librarian of the Plume Library and an all round sportsman. He participated in rowing, cricket, golf, lawn tennis, swimming, hunting, shooting and he was described as being a capital horseman and the fastest runner and best jumper at his college. He was a Founder President of Maldon Golf Club and served as President of Maldon Rowing, Cricket and Lawn Tennis clubs, as well as the amateur dramatic and philharmonic societies. I was grateful to Robert Shanks who recently pointed out to me that, at Maldon Golf Club’s centenary celebrations in 1991, he was privileged to play the part of Edward Russell Horwood in a re-enactment of the club’s founding ceremony. Edward was educated at Brasenose College, Oxford where he gained an M.A. degree in 1846. He was also a very prominent Freemason and one of the first members of the Lodge of St. Peter who meet at Cromwell Hill. This lodge has been, over the years, and still is very generous to All Saints. If you look at the lectern in our church you will see that there is a plaque on the base which commemorates the fact that it was presented by the masons in gratitude for being allowed to hold their meetings in the tower of St. Peter’s church when they had nowhere else to go. Having once got the bug of interest and curious to see what else I could find out, I undertook to locate Edward’s grave. At the time I was not sure if he was even buried in Maldon although it seemed a fairly safe bet that he was. The one certain thing is that his body was not in All Saints’ graveyard as interment there had ceased many years previously. In the event and with the help of Maldon Council, his grave has been located at London Road Cemetery. The grave also contains the remains of Edward’s year old son, Edward Dudley Horwood who died at the vicarage in 1860. Regrettably it has been badly neglected over the years and is grossly overgrown with brambles. It was at one time my intention to try to get the grave cleared so that we could go at least part way to restoring it to its former glory and then hold a short service there. It would have been nice to do this in memory of a great servant to All Saints. Regrettably a lack of sufficient bodily mobility on my part and the reluctance of others to come forward to help means that this will now probably never be achieved, which I find to be very sad. The local council have pointed out that they have no responsibility for this. One other thought came to mind and that was to carry out some more research with a view to finding out where Edward’s wife Caroline is buried. As she died 15 years after him, however, it is highly likely that she moved elsewhere in the country so this a difficult task. There is no evidence at present that she is buried on the same site as her husband. I have also been able, with the help of the Plume Library, to locate three ERH sermons. These make for very interesting reading. I shall hopefully be reproducing these on this website in the near future. On Sunday 22ndOctober 1865, in a sermon dedicated almost totally to the death of Prime Minister Lord Palmerston, his words were ones which I only wish it would be possible to echo today: “Our country is in possession of a wealth and prosperity unprecedented in her annals; she is at peace with the world, and, what is a singular coincidence with the death of our great statesman, all the nations of the earth are at peace with one another.” Wouldn’t it be nice if we could say that now. Poor Edward must be turning in his grave to see the world in 2011. Not too encouraging, I think you will agree and, as an aged and venerable hearer myself, I think I would prefer not to develop that theme any further. One thing is certain and you will have gathered from the foregoing that Edward did not believe in mincing his words. At the same time, however, we have to accept that it is part and parcel of the job description of a parish priest to prepare us for what lies ahead. Inside the temple, the Romans had perished. It was said that their blood, aided by the natural drainage of the location, flowed straight into the river below, turning its waters black. The Romans called it “Aestuarium Idumanum” – the Blackwater. Although many claim that the large finds of Roman coins discovered at Colchester proved it to be Camulodunum, Horwood was not impressed. He reasoned, with faultless logic, that if a town had been sacked and pillaged then, surely, the riches would have been taken away. Very few of such coins have ever been discovered in Maldon and therefore, he argued, it proved that Maldon was Camulodunum. He wanted the row of shops on the High Street in front of All Saints’ to be knocked down and argued that this would reveal archaeological proof that the massacre of the Romans by Boudica took place in the graveyard of his church. He was also not afraid to get his hands dirty when there was a need. In 1873 there was a massive fire at Sadd’s Warehouses and timber yard. It was necessary to throw burning timbers into the river and, true to form, one of the first people into the fray pulling the burning debris clear was Edward Horwood. He was similarly seen in action on Sunday, 17th January 1892 when a large part of Maldon High Street was burned down – truly a man of action. In the spring of 1901, Edward, now in his eighties, had been ill for some time. On a wet day he was caught without an umbrella and was lent one to get home. An hour or two later, with the rain still falling, he took it back to its owner and returned home unprotected. He died at three a.m. on Sunday, 30th June 1901. Edward’s funeral is well documented. Suffice to say at this time that virtually all business in Maldon closed down and the streets were packed with mourners – such was the respect in which he was held. I have copies from the Essex County Chronicle and Essex County Standard of 5th July 1901 of articles giving greater details and it is the intention to reproduce these on this website in the near future. It was stated at the time of his death that one of the objects nearest to Horwood’s heart was the restoration of the interior of All Saints. I have to say that I suspect not a lot has changed there even after more than a hundred years. As I said in my opening comments, the researches carried out in this exercise reached out into the extended Horwood family. For example, I am in regular contact with a young man named Jonathan Spurrell, an Englishman who works in Paris as an interpreter. He is another descendant of the Horwoods, something like the great great grandson of Caroline Horwood, Edward Russell’s youngest sister who married the Rev. William Stuart a direct descendant of King Charles II. Jonathan came over to England for a few days in 2006, during which time Canon David Atkins and I met with him to show him round the church and I later took him to the cemetery and the Plume Library. This research has taken me to some very interesting places and some fascinating facts have been uncovered. I have learned that amongst the Horwoods and their descendants feature royalty (as just mentioned), generals and other high ranking army officers, many Italian Counts and priests galore. We find a Horwood descendant married into the Borgia family – more specifically Alberto Borgia who was the fascist chief of Florence in the 1920s. It has been a problem sometimes to avoid getting confused by the many surnames which have cropped up. To name but a few we have Spurrell, Stuart, Spry, Fothergill, Aldridge, Tingey, Cooke, Logie, Ormond, Learmonth, Prendergast, Gotto, Hooper, Hall, Bruno, Scarrone, Hughes, Dickson, Ferrins, Melita, Cooke, Scroffa, Congreve – and the list could go on. I find that there was a Charles Horwood who played cricket for Sussex but died in 1870 at the age of 30. We believe him to have been a family member but cannot yet substantiate this. Of particular interest have been the letters from India to family members from Edward Russell’s younger brother, Captain William Spry Horwood – all 97 pages of them - in which he tells of his experiences in the Indian Army at that time. You will recall that I mentioned him earlier as the great great grandfather of my Australian contact. His is a sad story. He went to India in 1840 as a 17 year old Ensign and served there for the next nine years. He married Jane Hall in 1846 when he was just 23 and they had a son, Charles in 1847. William died of tuberculosis in 1849 at the age of 26. His son grew up and joined the army and, on leaving, he gambled away his inheritance then went to work as a miner in New South Wales, Australia before he died in 1911 of pneumonia and influenza at the age of 64. It has also interesting to read reports of the murder in Russia in 1906 of diplomat William Horwood Stuart, nephew of Edward Russell Horwood and son of Rev. William Stuart (Edward’s brother in law) who was Vicar of Mundon from 1862 to 1889. The murder was shrouded in much mystery although suffice to say that it occurred at a time when Joseph Stalin was growing in power and influence. Where do we go from here? Well, Maureen and I have been to Aldermaston where we visited St. Mary’s church where the Rev. Faulknor Russell Horwood, son of our former Vicar, was incumbent for 38 years. We then went to All Saints’ church, Buckland in Buckinghamshire to see a stained glass window dedicated to Edward Senior, his wife and daughter and from there to Aston Clinton, the family seat of the Horwoods and St. Michael and All Angels Church. We found no less than eighteen graves of assorted Horwoods, most pre-dating the period of my investigation, as well as various other memorials in the churches and a variety of written references to more Horwoods than I could have imagined. I have taken pictures of all these graves and memorials as well as the churches in which they are situated and would be happy to show them to anybody on request. As many of the older gravestones are barely legible I also have available a complete transcript of what is written on each. The research continues, albeit in a very quiet way, in the hope that at some point we shall discover something new which will set off a desirable chain reaction. The memorial plaque on the wall in the disabled toilet is to John Dorislaus who died in Maldon in 1632. He was the son of Isaac Dorislaus (1595-1649) of Alkmaar, Holland and Elisabeth Dorislaus nee Pope (?-1634?) of Maldon. They were married by 1622 and for a time resided with Isaac’s father in Leiden before coming to Maldon in about1627. Several family members are recorded in All Saints parish registers under the name of Dorsley, an Anglicization of Dorislaus, including the deaths of John and his mother Elisabeth. The memorial to John Dorislaus is heavily weathered and not very legible. The wall in which it is inserted dates from 1728 and when it was inserted it would have been external and exposed to the elements, but it must be remembered that it would have been nearly 100 years old when it was placed in its present position. It is not known where in the church it had been placed previously. In 1627 Isaac Dorislaus (hereafter Dorislaus), who held the degree of Doctor of Law from Leiden University was appointed to the history lectureship in Cambridge University. He moved to Cambridge in the October and, lacking accommodation there, his family settled with his father-in-law in Maldon while he became the houseguest of Samuel Ward, master of Sidney Sussex college. Dorislaus gave just two lectures on Tacitus’s Annals before he was silenced by Matthew Wren, master of Peterhouse, who suspected him of teaching republicanism. Other Cambridge heads declined to oppose Dorislaus and the matter was placed befo re the King who prohibited him from lecturing again. Dorislaus returned to Maldon where he took up legal advocacy and eventually, as a supporter of Parliament, became an advocate of the army during the civil wars against the king, Charles I. Eventually the king was captured by Parliament and put on trial for treason. In 1649 the commissioners for the trial of Charles I appointed him one of the counsel for the prosecution. He helped to draw up the charge of high treason, in terms which derive from his Cambridge lectures. He did not speak during the trial but said he would have, if Charles had acknowledged the court and answered the charge. This Charles did not do. After Charles’ execution, Dorislaus went to The Hague, on a mission for Parliament. On 2nd May 1649, a group loyal to the crown, led by Walter Whitford, entered his inn and he was stabbed to death. The assassins were never brought to justice. His body was brought back to London and laid in state. After an elaborate funeral paid for by Parliament, he was buried in Westminster Abbey but his body was re-interred in St Margaret’s Westminster after the Restoration of Charles II. Isaac Dorislaus, John’s father, was survived by two daughters, Elizabeth and Margaret and a son, also Isaac (d. 1688). He became a translator and intelligence agent for Parliament. N.B. This brief note draws heavily on the article entitled ‘Dorislaus, Isaac (1595-1649)’ by Margo Todd in the online edition of the Oxford Dictionary of National Biography. PLUME, THOMAS (1630–1704), archdeacon of Rochester, and founder of the Plumean professorship of astronomy, was the second son of Thomas Plume, alderman, of Maldon, Essex, by his third wife, Helen. He was baptised at All Saints', Maldon, 18 Aug. 1630, according to the entry in the register, but in his will Plume bequeaths communion plate to the church 'in thankfullness for my Baptism there Aug. the 7th, 1630.' Plume was doubtless using the new style, which was eleven days behind the new. He was educated at Chelmsford grammar school, and on 29 Feb. 1645 was admitted a pensioner at Christ's College, Cambridge, where he matriculated 11 July 1646, and graduated B.A. and M.A. in 1649. He was admitted B.D. per litcras regis 1661, and D.D. 27 June 1673 (Grad. Cant. 1823, p. 373). He was instituted vicar of Greenwich on 22 Sept. 1658, Richard Cromwell, Lord Protector, being patron. Not far off, at Cheam, Surrey, was John Hacket [q. v.], whose friendship Plume had already for some time enjoyed. After Hacket was appointed (1661) bishop of Lichfield, he made use of Plume's services to buy books for him, and to transact other business in London. He records, 16 March 1667, his 'promise of the next prebend that shall be void if I live so long, to Mr. Plume of Greenwich, who is of great merit' (Tanner MS., Bodleian Lib. xliv. f. 108). The promised prebend did not come from Hacket, but when he died the bishop left Plume 10l. and two volumes of manuscript sermons. These Plume edited under the title of 'A Century of Sermons,' prefixing a life and death of the author in 54 folio pages (London, 1675; new ed. 1865, 12mo). Plume's father had been a prominent presbyterian at Maldon, but he himself subscribed the declaration under the Act of Uniformity on 28 July 1662. Between 1665 and 1669 both Pepys and Evelyn visited Greenwich church on Sundays, and they have recorded their commendations of Plume's 'excellent preaching' and 'very good' sermons. He held also the sinecure of Merston, Kent, where was no church, parsonage, manor house, or inhabitants. On 10 June 1679 he was installed archdeacon of Rochester. He remained vicar of Greenwich until his death at Longfield Court, the archdeacon's residence, on 20 Nov. 1704. On 24 Nov. he was buried in the churchyard of Longfield. Plume's portrait, which he 'forbad to be ever brought into' his library, now hangs in the council chamber at Maldon. Plume was unmarried, and left the considerable wealth he had acquired mainly for charitable objects. The sums of 1,000l., 700l., and 202l. 12s. 6d. he devoted to the foundation of a chair at Cambridge, bequeathing the money to Dr. Covell, master of Christ's College, Dr. Bentley, master of Trinity, Francis Thompson, D.D., of Caius, and William Whiston, Lucasian professor, to 'erect an observatory and to maintain a professor of astronomy and experimental philosophy, and to buy or build a house with or near the same.' The statutes for the trust were to be made with the advice of Sir John Ellis, master of Caius, 'Mr. Newtin in London [Sir Isaac Newton], and Mr. Fflamsted, the royal mathematician at East Greenwich.' They were confirmed by letters patent issued under the great seal, 11 June 1707. The money was invested in an estate at Balsham, Cambridgeshire, purchased soon after Plume's death; Roger Cotes [q. v.] was appointed the first professor, 16 Oct. 1707; and the king's gate of Trinity College, although objected to by Flamsteed, was appropriated to his use. An observatory was built soon after over the gateway, partly by subscription raised by Richard Bentley [q. v.] the master, who described it (Correspondence, ed. Wordsworth, p. 451) as 'the commodiousest building for that use in Christendom.' In May 1792, however, report was made that 'the professor had neither occupied the said rooms and leads, or fulfilled the conditions for at least fifty years; the observatory and the instruments belonging to it were, through disuse, neglect, and want of repairs, so much dilapidated as to be entirely unfit for the purposes intended.' The trustees agreeing to its removal, it was in 1797 demolished. The existing astronomical observatory, in the south wing of which the Plumian professor occupies rooms, was erected in 1822. Plume's gift has centred upon the professorship, although in the original bequest the observatory was placed first. It may be added that Robert Smith (1689–1768) [q. v.], Cotes's relative and successor, says that Plume was induced to found the chair through reading Huygens's 'Cosmotheoros' (1698), recommended him by Flamsteed, whom doubtless he knew at Greenwich (Edleston, Correspondence of Sir Isaac Newton, lxxv). To his native town, where he had already erected a school and library, Plume gave his books, manuscripts, and 'my large Mapp of the World.' This has now disappeared. The library keeper was to have 40l. a year and a house, the library was to be open to students free of charge, and books might be borrowed on proper security; it was thus practically a free library. For the support of the school Plume bequeathed a house in Maldon and the farm of Iltney in Mundon, out of which also a weekly lecture was to be maintained in All Saints', Maldon, while the vicarage was augmented by 200l. Ten poor boys of the two parishes were to be taught and clothed in green baize, and an exhibition for an Essex scholar established at Christ's College, Cambridge. Plume also anticipated the present poor-law system by giving 200l. and the residue of his estate to purchase tenements and stock for setting the pauper inhabitants to work 'according to Mr. Commins' direction and his Draught sent me by Doctor Thompson,' and for erecting a workhouse for the poor of Maldon and neighbouring villages. To his old school at Chelmsford he left books for a standing library. Others of his charitable bequests included 1,000l. to buy in the tithes of small livings worth under 100l. a year; 100l to Bromley College; various gifts to the city of Rochester, including a large sum towards repairing the cathedral; almshouses to Greenwich, and a trust to maintain a lecture at Dartford and Gravesend, and to augment poor livings in the diocese under 60l. value. Although a bachelor he devised 100l. to encourage the marriage of ten maids who had lived seven years in service. Robert Boyle's The Sceptical Chymist, 1680. Even though he lived in Greenwich most of his life, Plume left his collection of over 8,000 books and pamphlets, printed between 1487 and his death, to his home town of Maldon. It was kept in St Peter's Church, of which only the original Tower survives; the rest of the building was rebuilt by Plume to house his library. The library was to be "for the use of the minister and clergy of the neighbouring parishes who generally make this town their place of residence on account of the unwholesomeness of the air in the vicinity of their churches". Plume left specific instruction for the use of the library: "any Gentleman or Scholar who desires, may go into it, and make use of any book there or borrow it, in case he leaves a vadimonium [a pledge or surety] with the Keeper for the restoring thereof fair and uncorrupted within a short time". Plume's library continues to grow after his death with contributions from others. An online catalogue of Plume's collection was completed in 2009 and can be consulted via the Library's Library's website. The Plume Library is no longer a lending library, though books may be consulted in situ. In 1989 it was determined that 723 books of the original bequest were missing; the Friends of the Plume Library have endeavoured to replace the missing volumes, and have purchased over 160 such texts.